It is Jesuit Heritage Week here at Georgetown. Below are results of some of the most up-to-date research on global changes within the the Society of Jesus. This research was conducted by CARA Executive Director Thomas P. Gaunt, SJ, Ph.D. and presented at the annual conference of the Religious Research Association, October 30, 2010, in Baltimore, MD. The Jesuits are the single largest Religious Congregation of priests and brothers in the Roman Catholic Church and they work in almost every country of the world. The primary ministry of Jesuits is education, on both the secondary and university levels. Well established and well respected Jesuit schools have existed in Europe and the Americas for centuries. During the latter half of the 20th Century an extensive network of “popular education” schools were initiated by Jesuits particularly in Latin America and South Asia. The choice of ministries and the manner in which they are carried out has a great influence in the Catholic Church throughout the world. During the past 100 years membership in the Society of Jesus has steadily grown and steadily dropped. In 1910 there were 16,295 Jesuits worldwide and in 2010 there are 18,266. 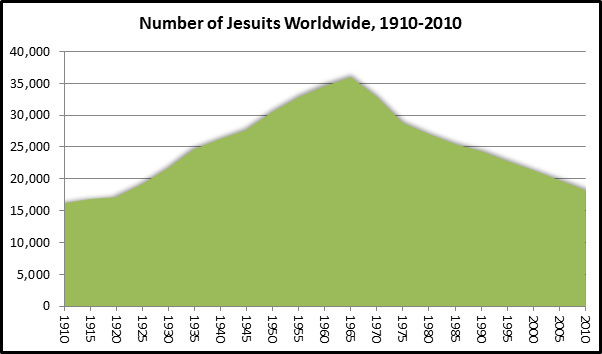 The number of Jesuits steadily increased year by year from 1910 until it peaked in 1965 at 36,038 Jesuits. 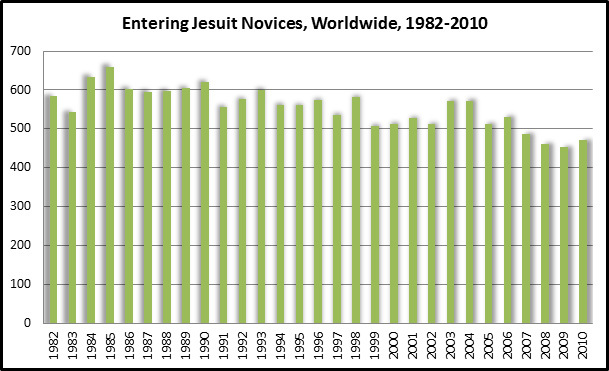 Since 1965 there is a steady decline each year resulting in about half the number of Jesuits as there was 45 years ago. Yet the figure above masks some of the dramatic changes in membership by geography and age that have occurred in the past 30 or more years. United States – USA, Jamaica, Belize, and Micronesia. 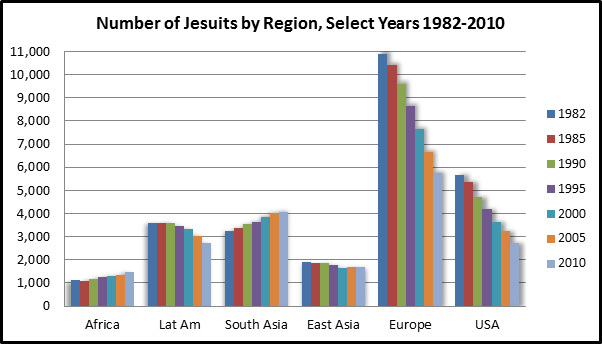 When the total number of Jesuits by geographic region is examined it is clear that the steep decline in the number of Jesuits in Europe and the USA dwarfs the steady growth of the Jesuits in South Asia and Africa. The Jesuits of East Asia and Latin America have declined but to a much lesser extent. In 1982, Africa and South Asia had 16.4% of the Jesuit membership and Europe and the USA had 62.9%, yet by 2010 Africa and South Asia had grown to 30% and Europe and the USA had declined to 46.2%. 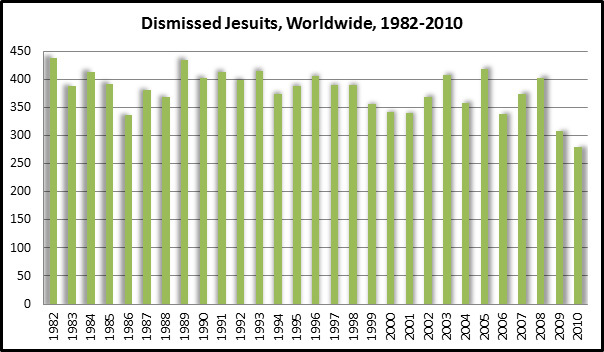 Over the course of the past 28 years the smallest annual decline in Jesuits worldwide was 167 in 1986 and the largest decline of 401 was in 2007. This is in sharp contrast to the declines of the late 1960’s and early 1970’s that saw declines between 811 to 1,037 each year (unfortunately geographic distribution data are unavailable for those years). Another way to examine membership in the Society of Jesus is to look at it in terms of the historically large regions of Europe and the USA in comparison to the smaller and newer regions of Africa, Latin America, South Asia and East Asia. In this view one sees a dramatic change in the membership of the Jesuits since 1982. Beginning in 2005 the majority of Jesuits is now in the developing world and will increasingly be from outside of Europe and the USA. These changes in the membership of the Jesuits are driven by three factors: the number of men entering, the number of men departing, and the number of men dying each year. And these three factors are not consistent across geography, at least for the past 30 years. In 1982, there were 583 men entering Jesuit novitiates around the world and 28 years later in 2010 there were 470 men entering the novitiates. Over this period of time the largest number entered in 1985 (660 men) and the fewest in 2009 (453 men). The changes in the number of men entering the novitiate differed greatly by geography as shown in the table below. A drop of more than 50% is seen in Europe and the USA versus the relative stability or growth in South Asia, East Asia and Africa. 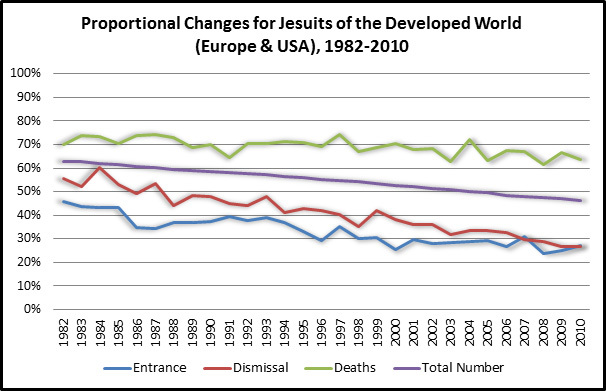 When these changes in the number and distribution of entering Jesuits is graphed according to those from the “developed world” (Europe and USA) versus those from the “developing world” (Africa, Latin America, South Asia and East Asia) the ever widening gap is clearly evident as the “developing world” entering Jesuits grows from just over one-half to nearly three-quarters of all new Jesuits. 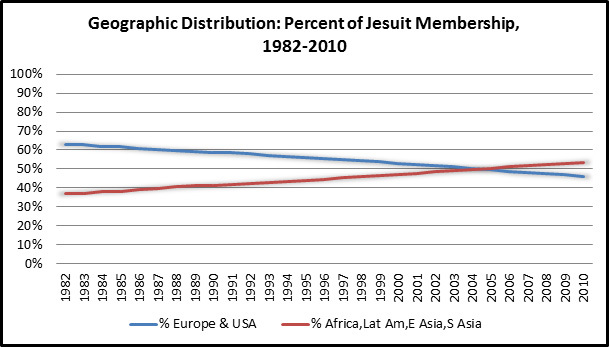 The number of men leaving the Jesuits over the past three decades also varies by year and geography yet it fairly closely follows the pattern of proportional changes as Entering Jesuits. 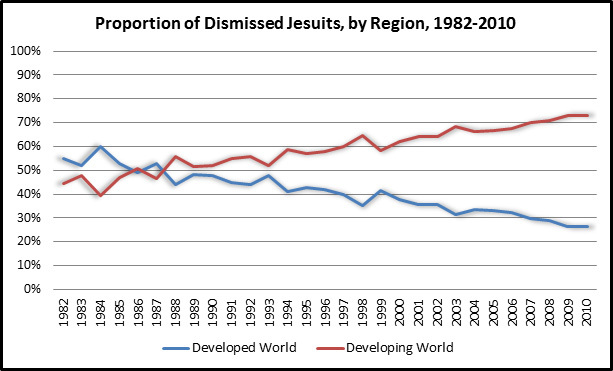 In the second figure below we also see that the proportion of Jesuits leaving the Society from the “developing world” goes from about 45% to nearly 75%. 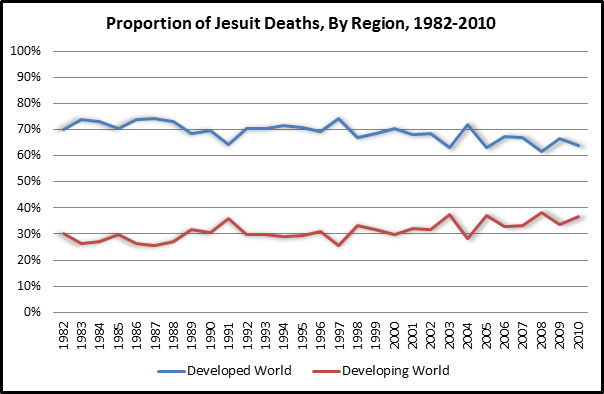 The number of Jesuits that died in 1982 (423 deaths) and in 2010 (428 deaths) are almost the same yet there are about a third fewer Jesuits worldwide (26,298 versus 18,266). 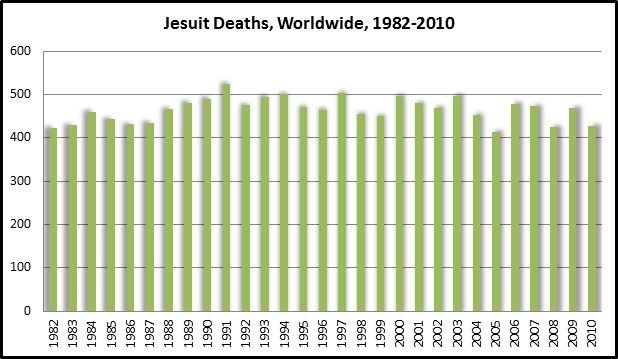 The figure below shows the number of Jesuit deaths peaking in the early and mid 1990’s and beginning to decline over the past seven years. 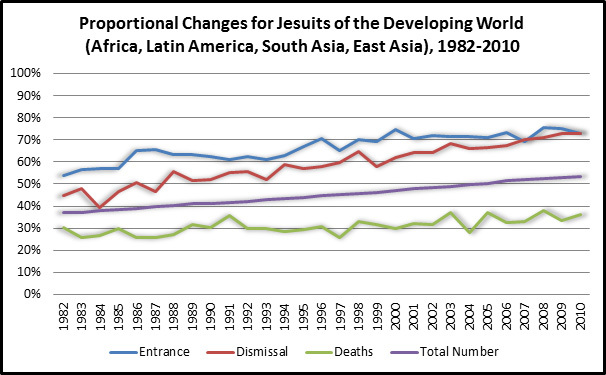 The proportion of men entering the Jesuits has steadily increased in the developing world while the proportion from the developed world has steadily decreased. The two lines representing the proportion of men entering and departing the Jesuits are narrowing and beginning to run together as time has passed in both the developed world and developing world. The proportion of men persevering in the Jesuits has become more and more similar across the world over the past three decades. The proportionate number of deaths has changed very little over the years geographically. 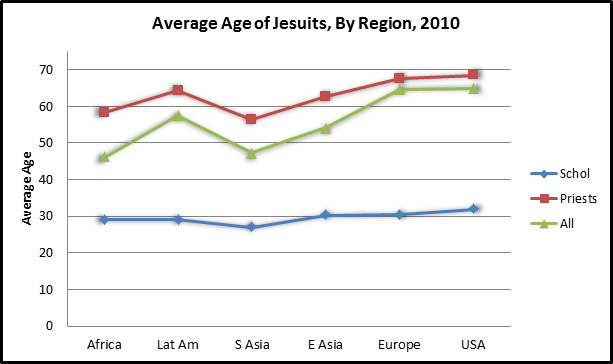 Whereas the proportion of total Jesuits in each area of the world has steadily increased in the developing regions and decreased in the developed regions. 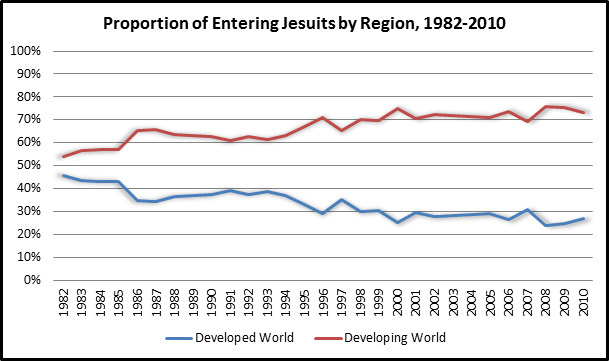 The proportion of men entering the Jesuits between the developed and developing regions of the world “appears” to be leveling out with about 75% from the developing countries and 25% from the developed countries. Once this occurs it will be the proportion of deaths that will continue to change over the next two decades as the age distribution, skewed by the large number of men entering in the developed countries post World War II, passes on. The figure below shows the average age for Scholastics (those Jesuits in formation preparing for ordination), Priests, and for all members in 2010. The current “youthfulness” of the developing regions of the world is evident as Africa and South Asia have an average age of less than 50 in contrast to the average age of 65 for Europe and the USA. Over the course of 30 years the Society of Jesus worldwide will have “flipped” in its geographic composition from two-third / one-third division of developed to developing world, to the reverse. Added to this is the great change in age distribution across the Society which is resulting in a rapid shift from a more European/USA Vatican II perspective to a more Indian/African post-Vatican II perspective. The change is both in generation and in geography which may be more creative and/or disruptive than might be assumed. An update to this analysis is available here.